Sometimes thins that are totally un-related to what I'm interested in hits my in-box and today is one of dem days. This is for the musical "Million Dollar Quartet". If you're unaware of the events that are depicted in the musical then a detailed description is over at wikipedia. 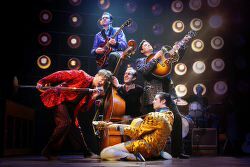 MILLION DOLLAR QUARTET is the new smash-hit musical inspired by the famed recording session that brought together rock 'n' roll icons Elvis Presley, Johnny Cash, Jerry Lee Lewis and Carl Perkins for the first and only time. On December 4, 1956, these four young musicians gathered at Sun Records in Memphis for what would be one of the greatest jam sessions ever. MILLION DOLLAR QUARTET brings that legendary night to life, featuring a score of rock hits including Blue Suede Shoes, Fever, That's All Right, Sixteen Tons, Great Balls of Fire, Walk the Line, Whole Lotta Shakin' Goin' On, Who Do You Love?, Matchbox, Folsom Prison Blues, Hound Dog and more. 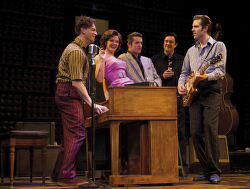 Million Dollar Quartet is now showing at the Noël Coward Theatre until October 1, 2011.